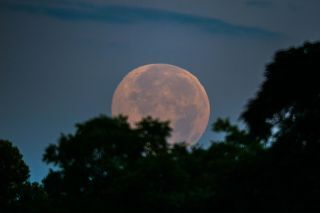 Photographer Greg Hogan shot this image of the Solstice Full Moon from Kathleen, Georgia using a Celestron 6N & Canon 7D. The June full moon, sometimes known as a "Strawberry Moon" fell on the summer solstice in 2016. Readers from all over the world sent in photos of the gorgeous celestial sight and you can see them here in our full gallery. This image is a composite of shots taken from Duluth, Minnesota's Park Point beach by photographer Grant Johnson. The Superior Entry Lighthouse can be seen in the foreground. On a nice night in Portland, Connecticut, photographer Mike Beck caught the full, strawberry, solstice moon looming large in the sky. Photographer Greg Redfern captured this image of the 99.8 percent illuminated moon of Spring's last moonrise from Shenandoah National Park. Photographer Greg Redfern captured this image of Spring's last moonrise from Shenandoah National Park. In a photo snapped near San Francisco, Calif., photographer Amy Van Artsdalen loves this photo "because of the pink and purple hues that [remind her] of a strawberry." The details of the moon's surface are crisp and clear in this image taken by Giuseppe Petricca on June 20, 2016, from Sulmona, Abruzzo, Italy, during a full moon. Behind the downtown skyline of Tucson, Arizona, the Strawberry moon rises bright and big, in this image snapped by photographer Sean Parker. Nichol Auton shot this stunning image of the summer solstice moon. In San Angelo, Texas, photographer Jessie Hall captured this image of the Strawberry Moon. Photographer Alva C. Poulos Jr., using a Celestron 127eq Powerseeker with a 15mm eyepiece at 67x, snapped this image of the Strawberry Moon. Photographer Shreenivasan Manievannan shot this dramatic image of the full moon over half dome and Yosemite Valley.